Click Car Removal is your local car buyer paying cash for cars in Brisbane up to in Brisbane regions, We are a car removal service provider that also remove your vehicle from your premises when you sell your car to us. Click Car Removal offers exceptional “cash for cars removal service” in Brisbane region for many years and throughout time have removed & paid cash for old cars that are no longer wanted. Being No.1 car removal company in Brisbane our main priority is customer satisfaction and above all to buy your car for top cash. We pay up to , on any unwanted vehicle. Our guarantee to our customers is to quote a fair and honest price for their vehicle, guaranteeing our best or highest payout. When you don’t want to be let down by an insulting offer on your vehicle, give us a call. ANY MAKE, ANY MODEL, ANY YEAR, ANY CONDITION. WE WILL BUY IT FOR CASH! For an instant cash quote on your vehicle, contact us at the number below. Click Car Removal pays cash for used & scrap vehicles. We are Brisbane’s top car buyer quoting prices that are fair and based on the resalable value or recyclable value of a auto. When you have a used vehicle for sale or a scrap vehicle you would like out of your yard, contact us, and we will make you a cash offer. Our system is quick, and there is never any pressure from our reps. Simply a cash for cars offers that if you accept, it will be paid at the time we collect your vehicle. At Click Car Removal, the collection is always free. We are a car removal company that will send our service technician to your location to inspect and remove your vehicle at no cost. Our technicians operate custom vehicles that are designed to remove one, two, or multiple autos, so multiple appointments are not necessary. Click Car Removal has earned its outstanding reputation through honest and convenient services. We are a company that is professional in all aspects of the auto buying & wrecking industry and guarantee fair cash payouts that are quick and convenient. We pay cash for cars, used cars, junk cars, wrecked cars, etc., accepting any make and model of any age and condition. We are also a used & scrap auto buyer that doesn’t waste time. We won’t haggle over a price, or try to get our quoted price down once we arrive to inspect a vehicle. We make things as simple as possible. We are the car buyer that has earned its outstanding reputation by providing vehicle owners in Brisbane with outstanding services. Click Car Removal is also a used & scrap truck and 4×4 buyer, paying cash for trucks and 4x4s. Our highest payout on any vehicle is . We are car and truck removal company that purchases used & scrap vehicles to recycle and resell and put immediate cash in the hands of our customers. Whether your truck or 4×4 is no longer the road warrior that it once was, or you cannot find a buyer, contact us and we’ll make you a cash offer. Something other than a car, truck or 4×4 for sale? Our used & scrap auto buyers specialise in all makes and models of vehicles and guarantee to quote you a fair price. We pay cash for SUVs, buses and motorcycles, and have the reputation of not disappointing vehicle owners with our cash quotes. Click Car Removal is considered the eco-friendly car wreckers. The reason we have this reputation within the community, as well as the industry is that we don’t just wreck vehicles, we recycle vehicles. Our car recycling standards are green auto recycling standards that both protect the environment and pay the most cash to our customers. Don’t just dispose of your vehicle. 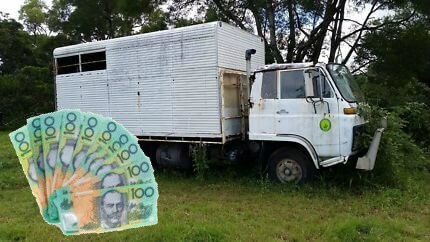 Get cash by recycling it with Click Car Removal Brisbane. When you choose Click Car Removal, you select one of the most respected car removal companies in Brisbane. We are a used & scrap auto buyer that is fair. We have built a solid reputation by providing vehicle owners with the best services and best payouts on their unwanted cars, trucks, vans, SUVs, Utes, Buses, 4x4s, Jeeps and motorcycles. Our company is one that is a fully licenced and insured used auto trader and wrecker, and one that cares about the services we provide. We have built our foundation on one that is a simple concept, and does not waste our time, or our customers time. We pay cash for cars of any make and model of any age and condition. We are the professionals that concentrate on our customers, as well as the community. With each car removal we complete, we guarantee that we are leaving the smallest imprint on the environment as we practice eco-friendly solutions like car recycling. For more information on the services at Click Car Removal, or to obtain an instant cash quote on your unwanted auto, give us a call at the number below. We also offer vehicle owners quick cash quotes on their vehicles here on our web page. Just complete our “Get a Quote” form located at the top right of this page, and click on the submit button. We will have an instant cash quote to you. We service Brisbane, Ipswich, Logan, Redland City, Gold Coast and Toowoomba with outstanding car removal services.